The Dark Ranger: Cheechoo Can Stay Home! Well - it is that time of year when playoff hockey is awe-inspiring and fun to watch, though on most levels as Blueshirt fans we actually don't care a whole lot. Most are afraid to actually say things like that and commission'ehr Herr Bettman never wants to hear such blasphemy from anyone that adores hockey, but here at The Dark Ranger we like our hockey home-style: at The Garden. Because we don't care about hockey other than our own, the beat writers are on the wire speculating who Slats and Co. are thinking about during the off-season, who is available and who we're going to have to trade in order to get another "a change of scenary to NYC will bring them back to the highly productive days" player. Here enters Jonathan Cheechoo of the San Jose Sharks, now reported by Steve Zipay at Blue Notes as a viable option for New York (Zipay actually used the words "from a spy out West"....which makes him sound more and more like the bloggers he criticizes). 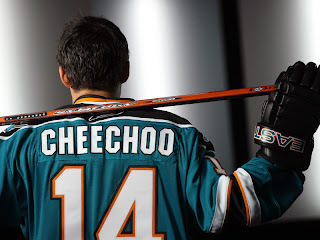 Here's my take: Leave Cheechoo in San Jose! Cheech is under way too much pressure. He"s griping the stick too hard and he wants to score. He's waiting to score, which is making it so that he isnt reacting on impulse or reflex, he's reacting on the pressure he feels whenever the puck comes to him. trust me with this one, I see him play every game and I can tell he's not the Cheechoo we used to know. The other night, he played on Joes line and he didnt even get one point (unless he got a secondary assist) when all the goals scored were scored by his line. But him playing on Joe's line is a good sign. Coach Wilson obviously thinks he can play better and well enough to be rewarded by playing on a scoring line. However, it's not showing up during the games and that's when it matters. There is so much expectation from Cheech that he cannot possibly live up to it. All you can expect is to be disappointed.... Besides, we all know Cheech isn't anything without Joe....even if you don't want to admit it. Now that is just one Sharks blogger's opinion, but hit the boards and you'll see the dramatic deterioration of goals and assists (see here) over the last three seasons. This sounds all too familiar (see Wade Redden) and as our Blueshirts are in desperate need of a scoring sniper or someone who boosts the confidence and the abilities of our highly-paid veterans, the last thing to consider is another 'once shining star' looking to light it up once again under the banner of the exciting Big Apple lights (and my economy-plagued season-ticket dollars). We need to focus on the youth on the current roster, the youth of our prospects and draft and seek out the rookies from other teams that are currently being overlooked. There are a limited number of free-agent options by July 1 that will be worth the limited monies the Rangers have left in salary cap -- so this may be the year to build a roster that has the energy to actually play a high-end attack-hockey Torts level of game (including the third period too!). So let's move on to realistic and smart signings, ok Glenny Boy? Oh, and by the way....one of my spys out West wanted me to say........"Rumor is the Red Wings are going to win the Cup!" I heard the same rumor here. Ooh, it must be true!!? 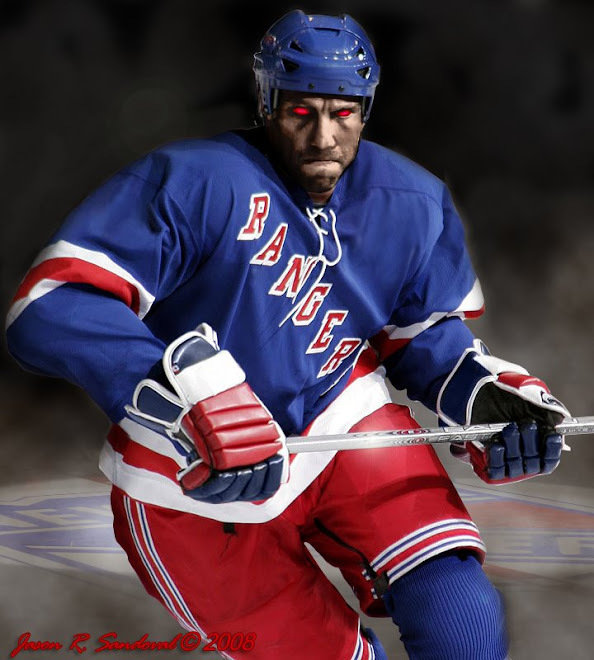 The New York Rangers officially sign Zaba. Go here, here, here, here for details and opinions. Good to see our boys in the office are actually considering building some depth in goaltending -- Vally has been shaky and it will be nice to consider new options if/when Hank decides to get injured. Agree on all counts. Cheech ain't what he used to be. It'd be nice if the GM could get someone with upside as opposed to someone about to hurtle down the side. And without using up every penny the Rangers are squeeeezzzzing out of us for tickets next season. Your take is the other side of the story and it's definitely a viable one. The way I look at it is if Cheechoo doesn't pan out and the change of scenery theory once again fails, then the at the very least the Rangers gained two million in cap space that can be used to re-sign Marc Staal next summer. Also with Rozsival gone, it opens another spot than can be filled by Gilroy, Sanguinetti or maybe even Del Zotto in when Rozsival would have had one year left on his contract. I think if he's healthy all Cheechoo needs is a change of scenery. Maybe he won't return to 50 goals but I think he'd been good to replace Naslund's 24. He's a banger which is an upside on Naslund, who stayed on the perimeter most of the time, and even in these playoffs he scored a creative clutch goal for the Sharks. If he does come, it would be the first time the Rangers had two native Americans on the team at the same time, Redden being the other one. Maybe having Redden there would help Cheechoo.